Town musicians (in German: Stadtpfeifer - in English: Waits) were primarily musicians employed by the borough councils of communities large and small in German speaking lands. Lüneburg sources mention them as early as 1335, listing their precise duties, their regular pay and detailing various other remunerations. Any person possessing a proper legal parentage could be a town musician. After an apprenticeship of 5 or 6 years - during which he learned to play many wind and string instruments - the guilds, according to their custom, made him a journeyman. Afterwards he either began working with his master, or set off on his travels gaining experience and applying for any post he happened to come across. As with other trades, it was possible to gain a position through family connections or marriage. This happened for generations to various members of the Bach family, who filled many town musician posts in Thüringia. The Stadtpfeiferei had to provide music for various occasions in civil public life. Thus twice a day they had to play tower music from the town or the church tower, they participated in official celebrations, festive processions, royal visits, weddings and baptisms, they assisted at musical events in the church, at school and church festivals, and provided for their own successors by training apprentices. In smaller communities they also did tower sentry duty. The tower music played as a signal twice a day generally employed 4 or 5 brass instruments (cornetts, trumpets and trombones) and later strings as well. 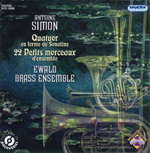 Harmonized versions of chorales, fanfares, brass signals and dance movements were played, as well as longer works, known as Turmsonate (tower sonatas), and in the 18th century even movements from sinfonias and concertos. Apart from Pezel and Reiche featured on this recording, town musicians of chief importance in musical history that may be mentioned include Balthazar (Lübeck), Hassler (Augsburg, Nürnberg), Telemann (Frankfurt, Hamburg), Quantz (Pirna, Dresden) and Zelter (Berlin). Johann Christoph Pezel (Pezelio, Bezeld, Petzoldt, Bezel, Bezelius, Petzel, Pecelius, 1639-1694) was born in Glatz in Silesia (today: K³odzko in Poland). He studied at the grammar school in Bautzen, later working in various town music bands (Stadtpfeiferei). His name is first mentioned in a Leipzig source when in 1664, following upon a decision of the city fathers, the number of town musicians was increased from seven to eight, and Pezel was given the position of fourth "Kunstgeiger" (violinist). In 1670 he then acquired the title of Stadtpfeifer, which in the guild was the equivalent of master, and which meant his position carried a retirement pension. 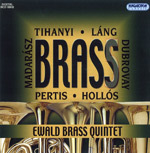 The same year he published his first important work Hora decima musicorum , a set of 40 single-movement sonatas for brass instruments (or alternatively string instruments). For today's listener their sequence of keys, time signatures and thematic connections make them seem more like two-movement sonatas. Elements of paired movements also appear in his tower music Fünf-stimmigte blasende Music (1685) recorded here. Of the original 76 pieces 16 are featured, intradas and dance movements (Allemande, Courente, Sarabande, Bal). Though the composer uses simple conservative harmony and the part-writing is given mostly to the outer voices, he is skilful and resourceful at making us forget any monotony or unsophisticated timbre. For example he varies the manner in which he arranges the part-writing in pairs and in parallel, and produces a lively effect by an imaginative alternation of homophonic and polyphonic sections. 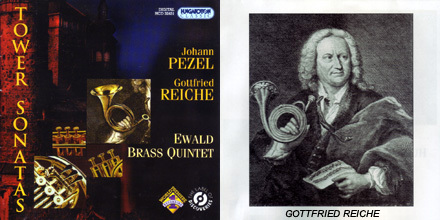 Gottfried Reiche (1667-1734) was one of the most important virtuoso trumpeters of the period. He was the chief trumpeter in Leipzig in Johann Sebastian Bach's works from the time the composer arrived there in 1723 until Reiche's death. He was born in Weissenfels which boasted a rich trumpet tradition, and worked in Leipzig from 1688, first as a Kunstgeiger (violinist), then from 1706 as a city piper (Stadtpfeifer), and finally from 1719 as chief town musician (Senior Stadtmusicus). He was held in such high regard that in 1694 he was given bonus pay by the City Council just to keep him in the City at a particular period of time. If we think of the wonderful trumpet parts Bach wrote for him - which are the most ornamented and special trumpet parts of the baroque period - we can form an idea of Reiche's excellent skill as an instrumentalist. For his 60th birthday the city commissioned a portrait by E. G. Haussmann, and this has become the subject of much scholarly controversy. In the painting we see the trumpet in the musician's right hand, symbolizing his trade, while in his left hand he is holding a piece of music manuscript on which can be seen a fanfare entitled Abblasen , an effective virtuoso piece two lines long. Some scholars argue that there is much evidence in support of the fanfare being not a work by Reiche, but by J. S. Bach, and that Bach wrote the little piece as a birthday present for his favourite trumpeter. Certainly the style of the music would suggest this. Since then the fanfare, clearly legible in the painting, has been published many times and often recorded, making it a sort of baroque hit. Reiche composed mainly tower music, sonatas in five parts and shorter pieces - most of which music is unfortunately lost. 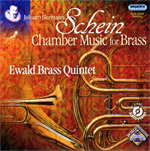 His most important surviving work is Vier and zwantzig neue Quatricinien (1696) for cornet and three trombones. It is a colourful set of 24 fanfares, 10 of which have the title Sonatina , mostly chordal and homophonic in character, these alternating with 14 others which are polyphonic and entitled Fuga.